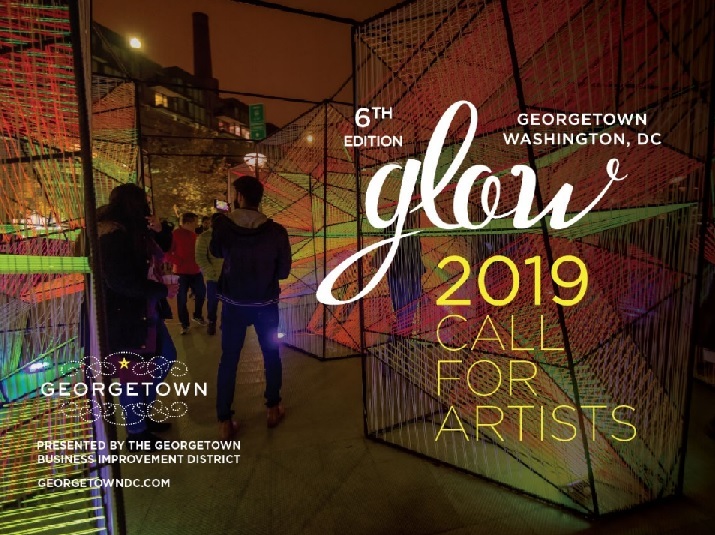 The Georgetown Business Improvement District (BID) invites artists to submit proposals for the sixth edition of its Georgetown Glow Winter Public Art Exhibition, an outdoor display of light-art installations on view in Washington, D.C. from November 2019 through early January 2020. Georgetown Glow 2019 is free and open to the general public. Installations are lit nightly from 5 to 10 p.m. in the commercial district. Georgetown Glow 2019 is part of the BID’s overall holiday programming. It includes the region’s largest outdoor ice skating rink, holiday shopping, and a holiday window competition. The event includes charming buildings, yuletide decorations, and more than 450+ stores, restaurants, galleries, and salons to shop and dine. The Georgetown neighborhood is internationally renowned. It is the D.C. area’s top stop for all things holiday. Georgetown Glow 2019 is open to all artists including performance, video, and sculpture that creatively incorporate light as its primary medium. Light at the center of each project. Artists are encouraged to explore concepts of space and place, inspire public interaction, and utilize and respond to Georgetown. The Georgetown BID will not accept projects where light is simply illuminating your art work. The role of light must be essential and integrated with your concept. The all-inclusive budget for each individual project can not exceed $15,000 USD. The budget includes artist fee, all labor costs to build the artwork (from concept to installation on site), all materials, all equipment, all cabling and cable covers, installation, de-installation, engineering services, testing needed for your artwork, shipping costs, permits, all travel and accommodations. The Georgetown BID will provide a discounted hotel rate at a local hotel and basic maintenance. If the artwork requires a budget beyond that provided by the Georgetown BID, the artist is welcome to seek and propose accompanying sponsors. The artist must indicate the contribution of sponsors within the submission. Private sponsors will only be given recognition as a sponsor in our communication if a specific agreement is made and if the sponsor does not conflict with other Glow sponsors and Georgetown BID businesses. In December of 2013, the Georgetown Business Improvement District (BID), in partnership with Alliance Francaise D.C., hosted four international artists who showed at the Fête de Lumieres, one of Europe’s most celebrated festivals held annually in Lyon, France, since 1852. This was the first time that any of the Lyon installations had been exhibited in the United States. In 2014, the Georgetown BID launched Georgetown Glow by commissioning artists to re-imagine the season of light through public art. Glow’s artistic aim is to encourage contemplation of, and interaction with, the natural and historical environment of Georgetown, Washington, D.C.’s oldest neighborhood that dates back to 1751. Over the past five years, Glow has worked with 60 artists and 40 installations. Going into its sixth year, Glow is larger and a widely-recognized public art exhibition in the Washington, D.C. region. For more information, contact georgetownglow@gmail.com.